...... effects like black and white, sepia, blur, emboss, red eye correction, twirl, grayscale, add border and more; Touch-up images by adjusting brightness, contrast, sharpen, smooth, color balance and etc. 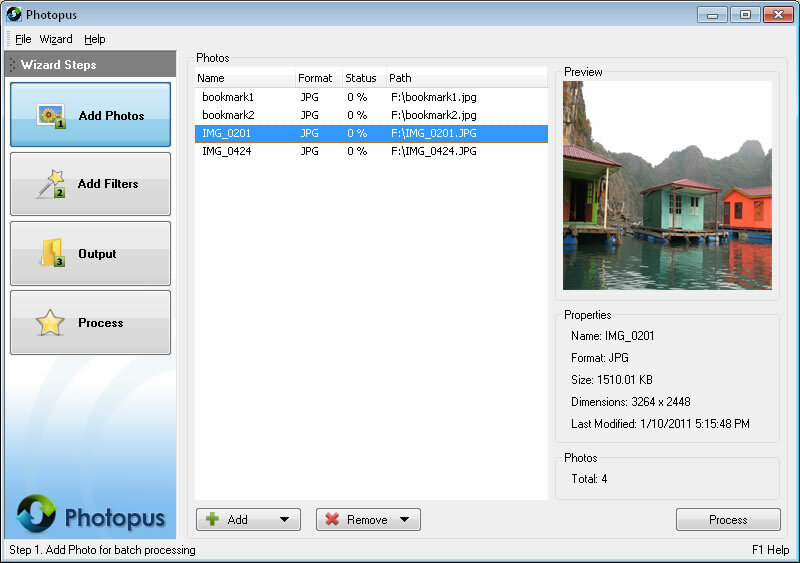 Photopus comes with clean and well designed interface. It only involved 3 steps to process your images: Add Photos, Add Filters, Output. Through every step of the process you can preview the changes made before saving the images. Settings can be saved and load for next image processing project. Photopus supports over 60 images formats including BMP, JPG, GIF, TIFF, TGA, PNG, ICO, PDF, PDF/A, PSD, WMF, EMF, JBIG, JBIG2, WBMP, PICT, PCT, JNG, JPEG 2000, PIC, ICB, VDA, VST, PDD, WAP, WBM, EXR, PNM, PBM, PGM, PPM, XPM, CUR, CUT, DDS, DIB, FAX, HDR, IFF, BIE, JBG, JB2, JIF, KOA, LBM, MNG, PCD, PCX, PFM, PGM, RAS, SGI, RLE, XBM, EXIF, JTIF and etc. Multi-page image format is fully supported. Qweas is providing links to Photopus 1.1 as a courtesy, and makes no representations regarding Photopus or any other applications or any information related thereto. Any questions, complaints or claims regarding this application Photopus 1.1 must be directed to the appropriate software vendor. You may click the publisher link of Photopus on the top of this page to get more details about the vendor.